What is chain? The Merriam-Webster Dictionary defines chain as, “A series of links or rings, usually metal, connected to or fitted into one another and used for various purposes…,” or, “a series of links used or worn as an ornament or insignia.” Simply speaking, chain is a series of joined metal links. The making of chain, as well as the variety in uses for chain, evolved over thousands of years as humans became proficient in the working of various metals. Since ancient times, artisans all over the world used chain as an integral part of jewelry. 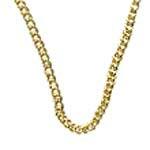 In fact, the earliest record of gold chain used as personal adornment dates to about 6000 BC! The British Museum houses several examples of early linked chain, both simple (Figure 2) and more complicated woven designs (Figure 3). At least a few forms of woven link chains date from pre-Roman times—some experts attribute the development of this form to jewelers on the isle of Cyprus. Larger simple linked chains were also used for practical purposes, usually involving moving heavy objects or restraining people or things. Ships were sometimes moored with "iron cables" (probably chains) to prevent enemies or abrasion on sharp rocks from cutting the ship loose. The term "anchor chain" is mentioned in the Statutes of Genoa in 1441 AD. wearing mail (detail from the Bayeaux Tapestry). When we think of “chain mail,” the first thing that usually comes to mind is armor. 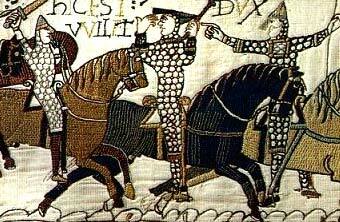 In fact, soldiers at the Battle of Hastings in 1066 are shown wearing mail armor. Hauberks (mail shirts) with hoods and chausses (mail trousers) are both depicted worn by the Normans in the Bayeaux Tapestry (Figure 5). Mail was so valuable that soldiers immediately stripped the armor from dead bodies on the field so that they could gain its protection (Figure 6). Humans have used armor of various sorts for thousands of years. 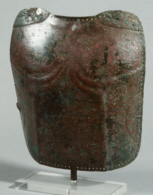 The most ancient armor probably consisted mostly of leather (hide) body coverings. As technology improved and armor making developed, three general forms of metal armor evolved: lamellar, mail, and plate. In general, lamellar armor is composed of strips of metal that are closely joined by lacing or links, or are attached to a fabric or leather body covering. Plate armor is generally made from thin sheets of steel formed to cover various parts of the body. Steel is made of iron and carbon. 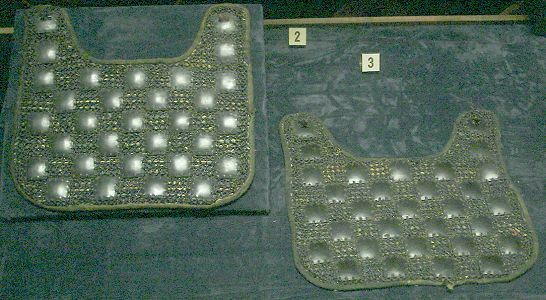 The Ancients made plate armor from bronze before the techniques of iron working became well known, (Figure 7). battlefield practice (detail from the Bayeaux Tapestry). During the Middle Ages, armorsmiths developed articulated plate armor. Mail, in particular, developed from the concept that metal rings could be joined to form a flexible mesh that could be worn to protect the body. In medieval and renaissance Europe, most “suits of armor” actually consisted of a combination of the three basic armor types. Mail (again from Merriam-Webster), then, refers to, “Armor made of metal links or sometimes plates.” In order to form a protective covering for the body in battle, man learned to weave the links of chain into a metal fabric called mail. The term mail derives from the Middle English maille, taken from Old French (the current French meaning of maille is "mesh"), and originating from the Latin term macula (meaning "spot" or "blemish"—this was applied to mail because the spaces between links in a chain mesh were apparently interpreted as spots). Examples of Etruscan mail date back to almost 300 BC. These fall under a family of patterns generally referred to as “Japanese,” because of their resemblance to armor from Japan. This armor consists of a combination of joined metal rings in a 2-on-1 pattern and, often, incorporates small plates joined by the rings (Figure 8). Japanese Pagode in Brussels, Belgium. The earliest European examples of mail date from the fourth century BC. Current research points to Celtic Gauls as the original developers of European mail. Most early European mail consisted of a 4-on-1 weave, although at least one archeological (first century AD) find uses a 6-on-1 weave. A table listing known archeological examples of early European mail has been compiled by David A. Counts at The Armour Archive. Why wasn’t mail made using complex decorative chain patterns? There were three reasons for this: weight, flexibility, and cost. The primary reason was weight—complex weaves used more links per square inch, and this would cause mail to be much heavier overall. Clients demanded lighter armor because heavy mail made the soldiers tire more quickly. An associated reason for simple mail weaves was flexibility—the more complex the weave, the less the armor could articulate or move with wearer. The price of a piece of mail armor was mostly dictated by the speed of its manufacture. During the Middle Ages and Renaissance, each link of mail was individually made, woven, and riveted. This took the armor maker a goodly amount of time, and cost the buyer a considerable sum! With a high demand, armor makers tried to minimize the time spent on each piece of mail produced. Their goal was to make the lightest, most flexible armor at the lowest possible price. Under these circumstances complex weaves were, for the most part, out of the question. Mail links were made and closed in four manners. Solid links, used in Roman times, were apparently punched from sheet iron. Forge-welded links were originally open loops made from hammered or drawn wire where the ends were welded together using heat and pressure (a forge and a hammer). Riveted links were open links where the wire ends were flattened, overlapped, and then individually riveted—this technique gained momentum late in the first millennium AD. The ends of butted links were not joined completely but, instead, merely were aligned and "butted"(closed) together. Early mail was often butted. Most high-quality mail since Roman times was made using welded, riveted, or solid links, or a combination of these techniques, for strength (a research paper presented in 2000 by David Edge, curator of the Wallace Collection, discusses this in detail). 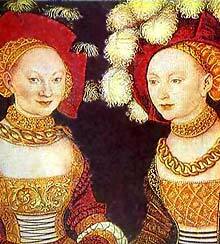 During the Middle Ages and Renaissance, butted links were used mostly for quick repairs. In modern times, however, butted links have become the norm for much "chain mail" jewelry and art! The term "chain mail" wasn't used until the nineteenth century. This, as explained by the Metropolitan Museum of Art in "Arms & Armor—Common Misconceptions and Frequently Asked Questions," is a misnomer, as the terms chain and mail refer to the same thing—an item made from linked rings. However, the misused term has become commonly used in the modern setting, referring to both armor and to jewelry. The evolution of weapons and armor are closely related—as armor was developed to withstand certain types of weapons, new weapons were developed to penetrate evolving armors. In Europe, articulated plate and mail combinations replaced lamellar armor and mail as early as the 13th century for the well-to-do professional soldier (the knight). By the mid-15th century the use of mail decreased dramatically as over production of steel armor meant even men-at-arms could afford full plate. By the end of the 16th century improvements in the technology of firearms had developed to the point that plate armor made to withstand bullets was simply to heavy to wear, and image of the “shining knight” soon disappeared from society. However, mail continued to be made and used in the Middle East and India well into the 19th century. In most cases, this mail was made from butted links, as this was much easier and faster to make, could be produced by less-skilled craftsmen, and required only a minimal amount of fairly simple tools and facilities. 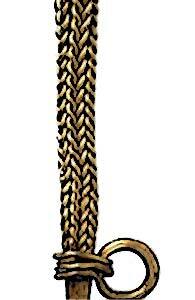 Linked jewelry chain has been made and used continually since the decline of mail armor in Europe. With the advent of machines to make fine welded chain (late 20th century), even some patterns of complex woven link chains are now being sold commercially (Figure 9). However, accompanying the increasing interest in both historical re-creation of the Medieval and Renaissance periods and the development of role-playing games, there has been a resurgence of mail making and an accompanying eruption of hobbyists making both jewelry and art from butted links! 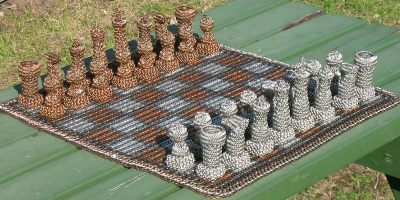 Figure 10: Chainmail chess set by David Austin. Because artisans can easily make links and construct chain art at home, this has become a hobby (and, for some, a business) with widespread draw in many countries. And, several companies are now producing links to supply the hobbyists and artisans. You can find information on many of the artisans, over 600 weaves (see example Figure 1), and a selection of interesting weblinks on the web site of the Mail Artisans International League. From jewelry to armor and back again, chain and mail are going strong! See links below for more information on chainmail. "Duncan" by Chimney Duck from M.A.I.L. website gallery. The British Museum collections contain several fine examples of early chains. These may be found using their COMPASS web site by searching using the term "chain." The Mail Artisans International League (M.A.I.L. 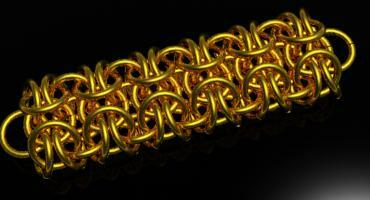 ), an organization devoted to chain mail artisans of the world. An amazing assortment of chain art by David Austin. An interesting “family tree” theory of chain and mail weaves has been constructed by David H. F. Coder. Simple instructions on how to make and weave chain links may be found on many websites. A few I have found simple and useful are: David Austin's Chainmail Construction, and Chris Morgan's Quick Guide to Making Chainmaille. Links of many varieties and sizes, as well as tools and other mail making supplies, may be purchased from The Ring Lord. If you want to add this article to your list of favorites or email it to a friend, please use this permanent URL, https://stores.renstore.com/-strse-template/0603A/Page.bok. Permission is granted by the author to quote from this page or use it in handouts as long as you include a link back to Renstore.com.